When it comes to a full, or close to full-sized, SUV, there are more options out there than latte varieties at your local coffeehouse. Picking the exact one that is right for you is no easy task. Start with a list of things you want: plenty of seating, copious amounts of cargo room, power everything and a comfortable and airbag laden interior. Add to that good looks and great gas mileage and you’re onto something. Basically, you want what dating experts call ‘The Complete Package’. 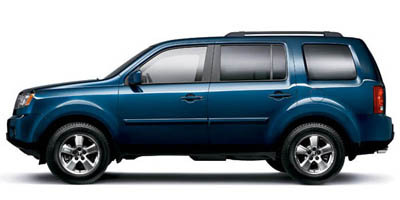 The new from the ground up, second generation 2009 Honda Pilot answers all of those demands and even provides some amenities you wouldn’t expect from a Honda. With its muscular exterior that’s anything but demure and an optional all-wheel drive system that’s ready to tackle wet roads, snow covered mountains and Costco parking lots, the Honda Pilot hits all the right notes. Of course, with gas mileage that’s more sedan than SUV-like and a fit and finish that’s Honda perfect, it’s hard to find fault with this Japanese automaker’s king of the hill SUV. The Pilot gets up to 23 miles per gallon highway thanks to Honda’s Variable Cylinder Management, which shuts down up to half of the vehicle’s cylinders depending on power needs. This SUV also comes standard with a lockable all-wheel drive system for slippery situations like boat ramps or snowy driveways. Powerful brakes and a stable platform also make for a confident ride. While the 3.5-liter V-6 engine is peppy, the Pilot could use a little more in the gusto department when fully laden or while towing. Also, a large C-pillar makes for an uncomfortable blind spot in a vehicle this large. Adjustable pedals are only available in the more expensive Touring trim. With just the driver and one passenger, the Pilot’s drive is remarkably similar to a V-6 Accord, albeit, a lot larger. The SUV isn’t light on its feet by any means, but the engine provides ample enough power to get out of its own way in tight situations. While the expected body roll is there, it’s less than you would imagine for an SUV this size, making for a pleasing, easy-to-drive vehicle. While we’ve come to expect a certain amount of cabin noise in SUVs, the Pilot is remarkably quiet inside. Even in off-road situations, the Pilot was Honda-like – meaning safe, comfortable and quiet. The Pilot comes with a 3.5-liter aluminum V-6 engine, producing 250 horsepower and 253 lb-ft of torque. Those numbers are up by about 10 horsepower over last year’s figures. The engine is coupled to a 5-speed automatic transmission that provides smooth, quiet shifts coupled to either front- or all-wheel drive. The Pilot is available with a voice-activated navigation system, DVD entertainment for rear passengers, heated leather seats, an impressive 10-speaker sound system and a power lift rear gate when equipped with the top-of-the line Touring package. Those bells and whistles boost the overall price tag to $36,795 for the front-wheel drive version. The lower line volume leader, the EX trim, starts at $33,595 and offers tri-zone climate control, heated side-view mirrors and fog lights. All Pilots can carry a total of 87 cubic feet of payload when the rear seats are properly folded, boast 12 cup holders and have impressive safety features. The Pilot comes with dual front, front-side and three-row side curtain airbags on every model, as well as a standard tow hitch in case Asimo, Honda’s humanoid robot, wants to ride in the trailer. The Pilot doesn’t disappoint when it comes to tech options. Entertainment tricks abound when decked in Touring trim, including MP3/Auxiliary audio input, USB input, XM radio and an MP3/Windows Media capable stereo. This SUV isn’t all play, either, with Bluetooth hands-free calling, a voice activated navigation system and a handy rear camera. As you might expect, Honda’s larger SUV dishes out respectable fuel economy, with the front-wheel drive model delivering 17 mpg city and 23 mpg highway. The all-wheel drive version dishes out numbers that are just slightly lower at 16 mpg city and 22 mpg highway. The Pilot is rated ULEV-II CARB. The Pilot’s interior features pleasing controls located just within reach. In Touring trim, a snappy leather-wrapped steering wheel with incorporated audio and cruise controls sets the tone. Brushed aluminum accents, clean gauges and a comfortable seat welcome the driver. The back seat offers nearly as much room as the front, with the kind of legroom the NBA could get behind. 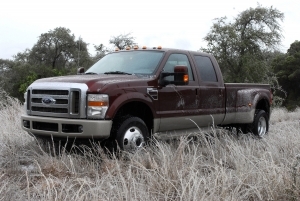 An optional power lift gate makes loading a cinch, and first-for-‘09 fold-flat seats open up the rear when needed. It’s like a Fit on stilts. Starting at $27,595, the Honda Pilot goes toe-to-toe with SUV mainstays like the Ford Explorer at $26,195 and the Chevrolet Trailblazer at $28,490. It’s very easy to push the Pilot up to $40,000 by selecting all of the options, which puts the Pilot into deeper waters where the Acura RDX at $33,695 and the Lexus RX at $37,700 lurk. Still, the truck remains well priced amongst its competition. With a standard tow package, six air bags and a confident and comfortable ride, Honda’s Pilot delivers exceptional SUV performance. Designed for toting the kids around town and handling whatever vacation destination the family desires with plenty of cargo and seating options, the SUV gives us the impression that Honda has no intention of backing out of this segment. While the fully loaded price tag is a bit steep, there’s no denying that with this rig, you get what you pay for. If you’ve skipped the Pilot while looking for your perfect SUV, stop and take a look. There’s plenty to love.